The card game is heading online for the first time in a flash-based web game. 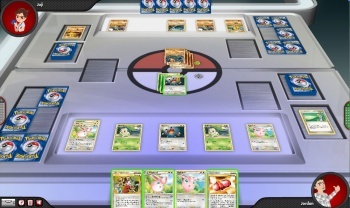 The PokÃ©mon Company is turning the videogame-inspired PokÃ©mon collectible card game back into an online video game that will launch this spring. The game will launch with three pre-made decks to play with. Players will also be able to use decks from the upcoming Black & White expansion, by using codes that come with the decks themselves. The game will have 12 computer opponents with varying personalities and strategies which will supposedly challenge players at any skill level. Unfortunately, it doesn't seem like the game will have any facility to play against other people, but that could always come later on if there's sufficient demand for it. It's not the first time the card game has been turned into a videogame - PokÃ©mon Trading Card Game for the Game Boy Color has that distinction - but it is the first time it's been playable online. Better still, the game is free, so you'll be able to play even if you've never bought a PokÃ©mon card in your life. You can get updates on PokÃ©mon Trainer Challenge via the official website, and the game itself launches on April 6th.